Gluten-Free Bran New Muffins--They'll Make You Happy! Today’s gluten-free Bran Muffins—or gluten-free Bran New Muffins, if you will—are the result of two recent blogger challenges. I’d been thinking about Amy’s theme of Guiltless Pleasures for this month’s Go Ahead Honey, It’s Gluten-Free! 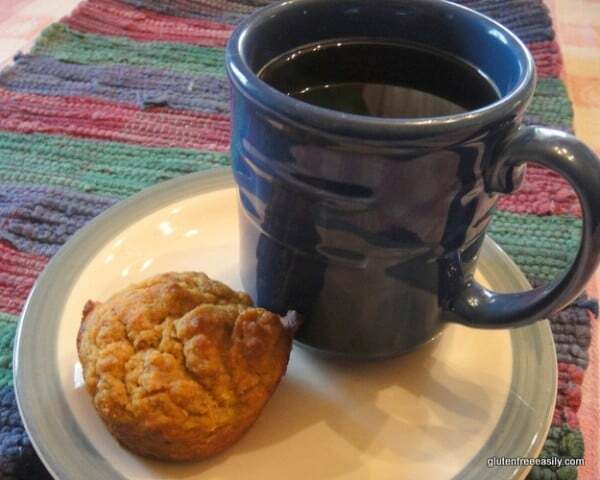 … and I’d been thinking about Linda’s (Gluten-Free Homemaker) Create A Muffin challenge, too. I wasn’t sure what my entry would be for either, but then I remembered a muffin that I’d come up with long before going gluten free that used buckwheat flour, cornmeal, and pumpkin. However, I’ve since learned that I’m as intolerant to buckwheat as I am to gluten, so I decided to re-create this recipe. My thinking … Why not try millet, which I’ve been using some lately with no consequences? And, why not make these muffins dairy free and refined sugar free as well? That would be a guiltless pleasure, right? So I did. When I tasted the resulting muffin, it tasted pretty much the way I vaguely remembered the earlier muffins tasting, which was very good. But, a few bites reminded me of something else—another flavor, another texture—but I couldn’t quite put my finger on it. Then I offered half a muffin to Mr. GFE. He took a bite, mumbled approval sounds, and said, “ah, bran muffins.” That was it! They tasted similar to bran muffins. WARNING: I’m about to get into some “bathroom talk” here. If you wish to avoid that, you can just skip down to the recipe right now. 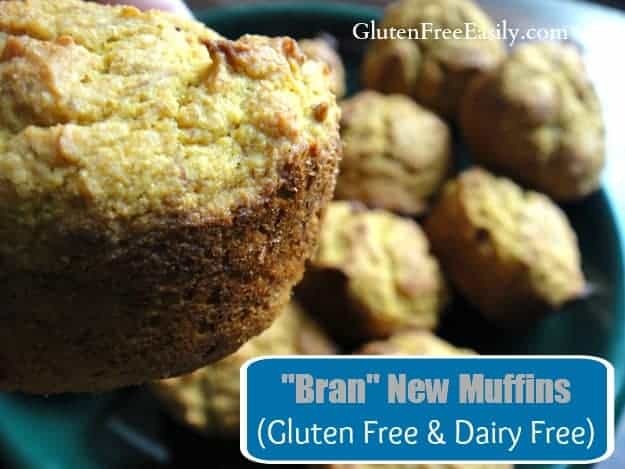 Many of us remember enjoying bran muffins before going gluten free. Or maybe we didn’t eat them because we liked them. Maybe we ate them for, uh, “medicinal” purposes, so there would be “no consequences” of our daily eating. Ah, don’t you love a good euphemism? Most of us who have suffered from digestive issues related to celiac or gluten intolerance have used many euphemisms over the years to make our symptoms and related illnesses more politically correct. But, as I told my classes at the Women’s Forum this past Saturday, my support group members and most folks who have been diagnosed celiac/gluten intolerant are long past euphemisms. We’re out of the closet and out of the bathroom! Now, please don’t misunderstand, we are not like the child who is going through potty training and wants everyone to hear about his poo or, worse, see his poo. See, I said THE bathroom word (or the milder form of it anyway). But, the fact is that the most recognized symptom of celiac and non-celiac gluten intolerance and gluten sensitivity has to do with bowel movements … either you have too many of them or not enough of them, or sometimes alternating issues with each. (Note: Not all individuals with celiac/gluten intolerance have this symptom. Recent studies have shown that extraintestinal symptoms are much more common in those with gluten issues today. Please check out my 20+ Reasons You Should Get Tested for Gluten Issues. If you are prone to diarrhea, your doctor may recommend fiber supplements, daily high fiber intake through the high fiber boxed cereals, adding oatmeal to your diet, eating bran muffins, and the like. If you are prone to constipation, your doctor may recommend fiber supplements, daily high fiber intake through the high fiber boxed cereals, adding oatmeal to your diet, eating bran muffins, and the like. Yep, that’s right … the same treatment is advised for each. In cases of diarrhea, the idea is that added fiber will add bulk to the stool and eliminate (or reduce) diarrhea. In cases of constipation, the idea is that fiber will help you have more frequent and easier bowel movements. Some folks actually decide to add in extra fiber on their own. For example, they may add baking whole wheat bread to their baking routine because of its health benefits and as a way to avoid loaves of bread made from refined flour and sugar, etc. In many cases, folks with gluten issues convince themselves that the extra fiber is helping but over time they might get worse, because there’s nothing like high doses of gluten to make a person with celiac or gluten intolerance demonstrate major issues with bowel movements and experience other symptoms as well (e.g., headaches, brain fog, fatigue). I started eating oatmeal daily the year before I was diagnosed. (I was also taking a fiber supplement daily.) I was convinced I was doing the right thing, the healthy thing. I had also convinced myself that having to go to the bathroom immediately after eating oatmeal was somewhat normal with the added fiber. Those foggy, spacey feelings I felt afterward… well, I just attributed them to something else … not enough sleep, not enough vitamins—all of us know how we can rationalize our woes. But, if you are having similar symptoms—and I read and hear daily about people who are—you should get tested for celiac. Normal bathroom behavior (ah, another euphemism, it’s ingrained in us!) is one or two bowel movements a day. It is not normal to have a bowel movement 10 times a day or on the other hand, only once or twice a week. Do not believe it if someone—and that someone could be your doctor—tells you that frequency is normal. Insist on testing even if your doctor dismisses your concerns. If necessary, find another doctor. After all, remember that there is a reason that most with celiac and non-celiac/gluten intolerance/gluten sensitivity are undiagnosed. As of this writing, the National Foundation for Celiac Awareness estimates that 95% of those with celiac remain undiagnosed. The founder and head of the NFCA (now known as Beyond Celiac), Alice Bast, saw 22 doctors before she received her celiac diagnosis. Clearly, she did not have doctors who were suggesting that she get tested for celiac—not until doctor #23 anyway. But if your celiac testing proves negative or your doctor won’t test you for celiac at all, don’t stop there. You can take the Enterolab Gluten Stool Sensitivity Test online through the doctor-administered website and/or you can take Enterolab’s gene test or another gene test for celiac (I took MyCeliacId, but that option is no longer available for individuals). One important note on gene testing though … the experts state that about 1-2 % of biopsy-proven celiacs do not have the genes associated with celiac. (Some even say that percentage is as high as 2-3 %.) Part of the thinking on why that is true is that perhaps not all the celiac genes have been identified thus far. The Enterolab stool test remains controversial and is, in fact, dismissed by traditional doctors including Dr. Alessio Fasano—who is considered one of our foremost celiac experts. However, a positive reading for gliadin antibodies vis this test has led many individuals who could not get a celiac diagnosis via the “gold-standard” (blood panel, endoscopy, and biopsy) to start down the gluten-free path to healing and ultimately become healthy people—when health had eluded them before. And, isn’t that really what our end goal should always be? To be healthy and feel like we have no bounds? For those of us with GI issues, that has meant having to know where every bathroom is and seeking out that info the minute you enter an establishment. Many safety-minded individuals look for the exits; we look for the bathrooms. I have no affiliation with Enterolab, but I am one who was initially diagnosed through its testing, at the direction of my own doctor (who is a “gold standard”-diagnosed celiac), and the resolution of my symptoms via the gluten-free diet. Now, how about those muffins. Do you still have an appetite? Don’t these gluten-free Bran New Muffins look good? These muffins are great either warm or at room temperature. They are just a tad drier after the first day, but still delicious and with a little reheating and/or a dollop of honey or butter (dairy or non-dairy, as you wish), problem solved. I believe that it’s the cornmeal that helps provide the bran texture. The millet (or buckwheat) provides the heartier taste. The pumpkin helps with the density and rich flavor, while both the bananas and the pumpkin provide the moisture. The pumpkin pie spice adds a delightful depth of flavor, but it doesn’t really make these muffins taste like pumpkin muffins (that’s a good thing). Similarly, the coconut oil doesn’t make them taste like coconut. Even the banana doesn’t give banana flavoring, just the moisture needed. All of the ingredients just come together to give you this tasty “bran” muffin without gluten, dairy, or refined sugar (although you can substitute granulated sugar if you prefer). Yes, these gluten-free "Bran" New muffins really do give you a "bran" taste and texture, plus they're delicious! Eat them for breakfast or serve them with a meal as your bread option. They're gluten free, dairy free, and refined sugar free as written but feel free to use substitutes that you prefer. Preheat oven to 400 degrees Fahrenheit. Grease or line 12 muffin cups with liners. Mix together millet flour, cornmeal, baking powder, salt, and pumpkin pie spice. Add eggs. Stir in coconut oil. Stir in pumpkin and banana. Stir until ingredients are incorporated, but don’t over stir. Batter may be somewhat thick. Fill muffin tins about ¾ full. Bake 15 – 20 minutes until done. No xanthan gum is required for this recipe. If using fresh pumpkin puree, you may have to cook a few minutes longer due to the additional water content. If you don’t have bananas (never a problem for me!) or pumpkin on hand, you can substitute 1 ½ cups of milk, dairy or non-dairy. If you have one or the other, but not both, feel free to use what you have for the total amount of 1 ½ cups. The flavor will be slightly different with all these methods, perhaps offering less of that “bran” taste, but they will still taste good! If you enjoyed these gluten-free “Bran” New muffins, you’re in luck … next week, for the last three days of March, I’ll be doing a different kind of March Madness. Yep, you guessed it … March Muffin Madness. I was so inspired by Linda’s Create A Muffin challenge that I couldn’t stop at just one! Hope you’ll join me over the next several days for all the gluten-free fun. If you don’t want to miss a post, subscribe to gfe via email or in a reader. Originally published March 24, 2010; updated June 13, 2018. Those muffins look great. I can’t wait to try them. Before I was diagnosed with celiac disease, one of my symptoms was constipation rather than diarrhea. I kept eating more fiber, particularly in cereals like bran flakes which only made matters worse! Thanks for sharing your own story. I alternated between the big D (another euphemism!) and constipation. I didn’t know what a normal bathroom visit was until after I went gluten free. What a pleasant surprise! I’m convinced there are so many folks baking fresh bread, eating bran, etc. and getting worse and worse. I hope some will read and recognize themselves. Great post, and great pictures! I tried to make some pumpkin muffins a few weeks back and they came out kind of funny. Will use this recipe next time! These sound great Shirley-and easy enough for me to make them! I’ve been wanting to give millet a try, and this looks perfect. The bathroom talk is a necessity … I even thought later of more stuff I should have included. Next time. Thanks for your support as always! You do your usual beautiful job keeping us informed. Thanks for the comments on my Passover recipes. Although, many use potato starch in a mix, rarely do they use it alone. For Passover, we can’t us most of the flours so potato starch saves the day. Almond flour and coconut flour are also versatile flours that can be used. Actually, all nuts make good fillers in a batter. Hi Chaya–Thank you, you’re quite welcome. It’s not a bad thing to have to rely on almond flour and coconut flour, or my personal favorite–flourless. 😉 Thanks so much for educating us and giving us some fabulous recipes at the same time! I like the recipe name, very clever! I used to love bran muffins before going gluten free; haven’t had one since though. These look really tasty! They look amazing. I too often ate bran muffins pre-GF, the taste just made me smile. And now I’ve always got corn meal and millet flour in the house, so these might even get made tonight 🙂 Thank you for this! These sound great. I think I need to whip up a batch for breakfasts! Speaking of bran, I miss raisin bran cereal. Is that weird? And I totally hear you on the adding more gluten to your diet thing (in an attempt to add fiber, as you said). Right before I went gluten-free, I remember eating an Oroweat bread variety and actually becoming nauseas from it. I finally attributed my sickness to the bread, and that was one of those final straws that clued me in to go gluten-free for a while and see what happened. Anyway, great muffins. Definitely going to have to try! Alta–I really enjoyed these for breakfast. 🙂 I don’t think it’s weird to miss Raisin Bran. There’s the crunchy, hearty taste plus those sweet raisins. I think I just miss the “ritual” of cereals. I ate a lot of cereal. I could never get enough of it. Cereal for breakfast if hubby wasn’t home, you betcha. But for me that was a sign that I had an issue, too. We tend to crave what we are allergic to. I think when we eat something on an ongoing basis, say your Raisin Bran, our body just sort of adapts and has an even plane of unwellness that we can’t necessarily decipher. But, introduce something new like that bread and bam, it shows you that it’s a problem. Glad it helped you figure out that gluten was your culprit. The muffins look fabulous! I started in on the bathroom tak, but since my lunch is almost ready, I had to save that reading for later – lest I ruin my appetite! Love the name of the post btw, very cute! Yum Shirley, these sound awesome! I love that you use millet flour and all of the yummy purees – banana and pumpkin! I’ll give them a try over the weekend. The kiddos will surely enjoy! Happy Spring to you and Mr. GFE!! Hi Ali–Welcome home! 🙂 Thanks so much. I really love these muffins. I’m going to have to get some more millet already! I’m thinking about using the millet, pumpkin, and cornmeal combo in another way, too. Hope that everyone loves the muffins when you make them! What great information – I have to say that before reading your post today, I was very much in the dark as to exactly what celiac disease does to people. Might sound silly but it’s true! These muffins look delicious, and I happen to love bran muffins so perhaps I should give these a whirl? 🙂 Thank you for sharing @ FOF! Hi Mrs. Jen B–Welcome to gfe! 🙂 No, that doesn’t sound silly at all … and you’re in some great company. Most doctors don’t even know what celiac disease does to people. That’s why it remains so undiagnosed … 95% of 3 million people who still don’t know they have it. I’m glad you learned a lot. Maybe it will help you, a family member, a friend … just spreading awareness is so important. They are yummy muffins! I hope you enjoy them if you try them. Please report back if you do. 😉 Now I must check back on the FOF to see yours and all the other entries, and check out your blog, too. My husband enjoyed reading this as he has patients who are on GF diets and have trouble. Thanks for linking up to FF. Hi can you tell me if you can sub, canned apple for the pumpkin as we have a very difficult time in the U.K getting canned pumpkin and the fresh is very expensive,. Are there any other alternatives? Hi Gail–Welcome to gfe! 🙂 While I’ve never made that substitution myself, I’d say go ahead and give it a try. But, first, consider how dense the canned apple is. Is it similar to that of pumpkin puree? How about apple butter? Do you have that? Depending upon its density, it might work, too. Neither of them won’t be quite the same in flavor as pumpkin, but might work perfectly fine. Other great options for a more similar flavor would be mashed sweet potatoes or mashed butternut squash. Hope you’ll have success whatever route you take! Let us know—thanks. These are great – made them last night.Easy to make and tasty. For my toddler, I like that they have banana and pumpkin in them. They really do have a strong resemblance to bran muffins – next time I think I might add raisins! 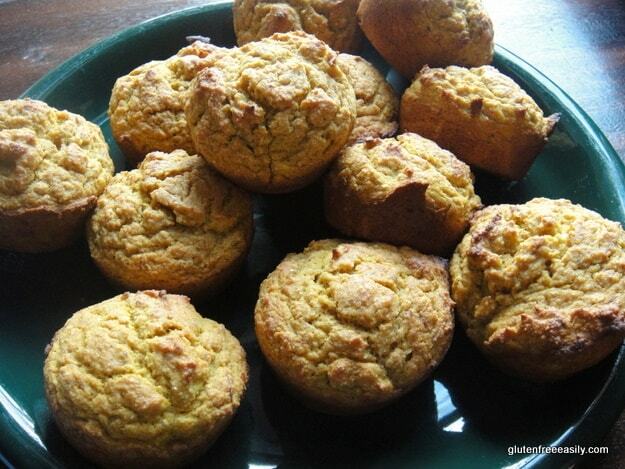 I’ve tried cornmeal in corn bread but never in a sweet muffin and I have no idea why not! Will have to give it a go now! Hi shirley! I tried these muffins last week and LOVED THEM!! I had them for breakfast in the morning-I’m always on the go and was looking for something like this. Totally awesome muffins, even my non-gluten-free hubby liked them as well. I’m making more today. I made a little adjustment to them because I didn’t have buckwheat or millet (can’t find millet in stores! ), I used Bob’s Red Mill All Purpose flour and also added some flax seed meal to them. Oh-and thanks for the poop talk! Hi Briana–I think we may have crossed paths elsewhere 😉 but welcome to gfe! 🙂 Thank you SO very much for taking the time to come here and leave a comment on your success with these muffins! I appreciated hearing that the recipes works well with all-purpose gf flour because I’m out of millet at the moment. 😉 I order mine from iHerb if you ever want to try some. (There’s a link on my sidebar that gives you $5 off your first order if you are interested. I’m an affiliate, because I love their products, etc.) Adding flax meal is a great idea! I’ve been using that more and more lately and just love it! LOL on the poop talk, but you’re welcome. 😉 Ironically, I was just thinking today that I needed to another part of the poop talk. Thanks again, Briana! For spices, I used 3/4 tsp cinnamon, and 1/4 tsp roasted ground ginger (it’s a new thing McCormick spices is putting out; I love it). And I used extra light olive oil instead of coconut oil. I poured the batter into mini-muffins, and then sprinkled each with quinoa flakes. Hi Yael–Welcome to gfe! 🙂 Oh, I love it when a reader adapts my recipe to their needs or what ingredients they like to use! Thanks so much for sharing your recipe–love it. 🙂 I’m still a teff “virgin” 😉 , but I’m with you on the other ingredients. Do you use a brand of teff other than Bob’s? I’d love to know of another one. Oh, I especially like that you used the extra light olive oil. I use olive oil more than I do coconut oil. I like the flavor it adds to recipes as well as the moisture. Coconut oil doesn’t always do that for me. And, sprinkling with quinoa flakes is another great idea–super duper nutritious “bran” muffins! However…I have teff in the house still, so it’ll be a while. Olive oil is just so nicely mostly-neutral. Oh! I refrigerated these overnight in a plastic baggie, and oh my WORD, they’re even more “bran” yummy when you nuke them. I had a strange idea that turned out well, too: mashed up a banana, nuked that, and poured it over the hot mini muffins. Soooo good. Hi Yael–Thanks for the additional info! I can’t eat buckwheat. It’s one of several gf grains I have issues with. Ideally, I’d like to try some teff to make sure I’m okay with that before I purchase a lot. I appreciate the link though. That looks like a good source for teff! So glad your muffins were even better the next morning! Hey, your idea on the banana is not that strange … I know I saw the same concept used elsewhere on a gf blog. 😉 The combo sounds great! I’ve just recently been looking through the recipes on your blog more. These look great! I will have to make them. I also had a very positive experience with the testing from Enterolab. My gastroenterologist was not very helpful when I was seeking a diagnosis for what at the time were very “classic” symptoms of celiac disease. Not only did I have digestive issues, but I also had lost 20 lbs without trying. In fact, I was eating more sweets and junk food than I should have and was still losing weight. I thought it was great until I started having other weird symptoms like my arm going numb and having dizzy spells. And looking back on it now, I had a really bad case of brain fog and I can’t believe I was able to even function. My doctor discounted my weight loss and my other symptoms (I guess he thought they were just due to stress or something). After performing a colonscopy, told me I had IBS and that I should eat more fiber just like you mention in your post. Well, luckily, there was a lot of information on celiac disease on the internet and I decided to go gluten free on my own. I felt so much better on a GF diet and several of my symptoms cleared up in a week or two. But for my own peace of mind, I decided to have the Entrolab testing done and discovered that even after two months of being GF, I still had elevated antibodies and I also had a gene for celiac disease and another gene for gluten sensitivity. It was nice to have that confirmation that I was on the right course. I’m glad it helped you as well. These muffins look fabulous! Perfect for fall. I made a yummy “bran” muffin using palm sugar and almond meal and linked back to this post! Hi Shirley! How could one make these muffins without the eggs? Use egg replacer (looks like flour)- you can get it at wholefoods, vitamin cottage or specialty health grocery stores. I use it all the time as my daughter is a celiac and is also allergic to eggs. Hi Claudine–Welcome to gfe. 🙂 Every now and then a comment gets past me and goes unanswered, so thank you for replying to Beverly. Since hers is an old comment, I hope she found the answer long ago, but your answer will be helpful to others. 🙂 Two other “tried and true” egg replacement options are flax eggs and chia eggs, and folks use a host of other ingredients to relace eggs (like bananas) that vary according to the application (i.e., type of recipe). Thank you for the delicious recipe! I have made it twice. First time I pretty much followed your recipe. Used coconut crystals for sweetener (low glycemic). Second time I used sorghum flour and Bob’s Red Mill Gluten Free Oat Bran(RS Elisa Certified), and agave. Hi there, Laurie!–Welcome to gfe! 🙂 I’m so happy that you are enjoying this recipe and I love that you’ve shared the info on the version you’ve made–thank you so much! Thank you for all the great information. I appreciate this. I am celiac. Hi Audrey–I think you’ve commented before and I didn’t get to give you a proper welcome … welcome to gfe! 🙂 I’m so glad that you are finding helpful info and recipes here! Hi! This recipe looks great, the only thing is that I am also intolerant of bananas. Would applesauce work in this case to replace the bananas? Looks like a great recipe! What could I use instead of cornmeal? Also, I’ve switched to grape seed oil for baking instead of using vegetable or canola oil. I like it a lot. I use coconut oil a lot, but don’t always want that coconut taste. Thanks! Welcome, Deb! Thanks! 🙂 In similar recipes, other have substituted ingredients like almond flour, millet, and the like, but I haven’t tried any of them yet. Let us know if you give one of the alternatives a try. Btw, you can actually get coconut oil from Tropical Traditions that has no coconut oil taste. It’s the Expeller-Pressed Coconut Oil that has the bland taste, so look around until you find that one. I use high quality grapeseed oil upon occasion, too. Coconut oil, EVOO, and grapeseed are the only oils I personally use. Hi – unfortunately I’m allergic to corn – is there something else I can use in place of the corn meal? Almond flour does work quite well instead of cornmeal. In case of nut allergies, so does subbing flaxseed meal. 🙂 Both 1:1 subs. I actually prefer the flaxseed meal since it stays moister longer. I have made these muffins soooo many times, Shirley! They are a terrific, and adaptable recipe. 🙂 thank you!! !